I Love this Brand! Very Good Quality! This sunny and sensational collection of flat-woven indoor/outdoor rugs is pretty, practical, and perfect for high-traffic areas. With its inviting assortment of classic and contemporary designs, tempting color palettes, and terrific textures, these multipurpose rugs will afford an air of simple sophistication to any environment. A cheerful and charming oversized leaf design is a fun, flirty, and fashionable way to uplift any environment, especially when presented in energetic hues of gold, persimmon, green, and blue. This Aloha indoor/outdoor area rug from Nourison is created from premium stain-resistent fibers for long wear, low maintenance, and a splendid texture. Easy cleaning and maintenance - just rinse with hose and air-dry. Ideal for heavy-traffic outdoor areas. . Pile height is .25 inches. This rug looks fantastic on my outdoor sundeck! I was a bit skeptical that the colors would not tie together well, but I was pleasantly mistaken! I have encouraged friends and family to look into this rug, as it is a great statement piece to add to your home decor. This rug is high quality, put in on our back patio and it looks great and holds up to any conditions. 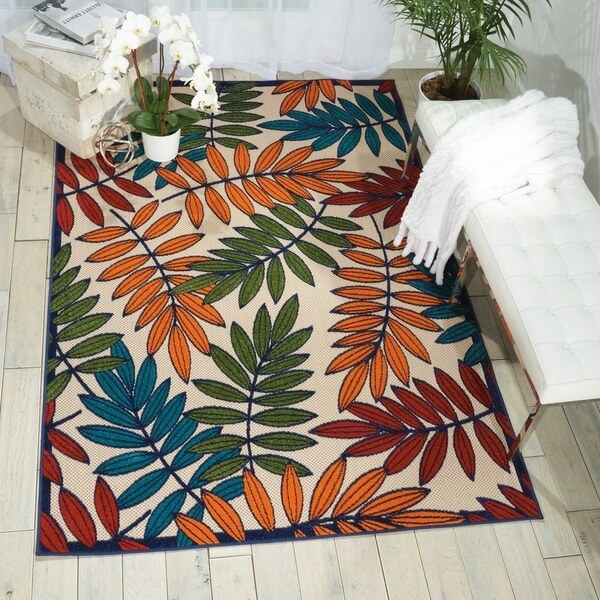 We brought this for outdoor .Fast shipping .I like this outdoor rug really this make my patio looks beautiful.my husband love this one .its look like same as picture. This rug is gorgeous! Everyone comments on it!!! Love this rug for my outside patio! Colors are bright and beautiful just as pictured. Drys quickly after a rain storm. Beautiful, beautiful and great quality rug for my small porch. Beautiful vibrant colors. My my patio furniture pop. LOVE the look.....added to a front entrance with lots of traffic! Looks GREAT! I love the vibrant colors and it will pair perfectly with my newly purchased Brown wicker patio couch.